Las Terrenas is located at the north of the peninsula of Samana on the shores of the Atlantic Ocean. Las Terrenas was an antique village of fishermen which profited from the arrival of many Europeans, in particular the french, which made it grow and modernized it. In this city you'll hardly find any power outages and you'll find almost all European comfort. Almost everything happens around the main street, on the bottom of the main street you can find the ocean and there you can watch a mix of modernization and typical Dominican, which gives a feeling of well being. Las Terrenas and its vegetation around it make this place look very beautifully and harmonic, the bay of Samana, large beaches full of coconut palms and banana trees as far as an eye can see, all of this and bathing in turquoise water make las terrenas a small paradise. The sunny beaches surrounded by green hills and the pure blue water, the harmony of these three colors will make magic moments unvergettable. Las Terrenas isn't a city you have to visit because there is very little history and neither nice contructions... but the harmony of the landscapes and the colors make this place magical and unforgettable. A memory anchored in your memory and the photographs which will make your colleagues at work jelous. Of course the sun, the ocean and its turquoise water and miles of sandy white beaches. A variety of beaches have to be seen while your in Las Terrenas like, Playa Bonita and Playa Cosón, which are some of the nicest and beautifulest beaches around. The beach in the center of the city isn't that beautiful after seeing the others, only that its close to the city and located directly to the main road which leads to the airport of El Portillo. You can also go Scuba diving (numerous diving schools around that provide diving tours), windsurfing and other aquatic sports are available except Jetski which is prohibited. Only a few miles away you can also visit the cascade of El Lemon, the national park of Los Haitises (which is of rare beauty), or you can visited the whales in the Bay of Samana which come to visit once a year during February and May, to give birth. Renting yourself a motorcycle and adventuring the beaches of Playa Bonita or Playa Cosón is also a marvelous memory and a moment of joy. You can visit the cascade of EL Lemon which is located in between Las Terrenas and Samana by horse, crossing the forest. The landscape and the cascade are magnificent. Below you can find a map (plain) of the city Las Terrenas which you can enlarge to read the details on the map like the names of the streets. Also on the map you can find important businesses and restaurants. Small hotel with 12 rooms, Casa Beach Hotel offers direct access to the beach, located in paradise where the palms, the sun and beach have the meaning of party. large rooms with ocean view, each room has a particular special attention, color, ambiance and the decoration of each room are different so they become more unique and for you to enjoy your vacation. 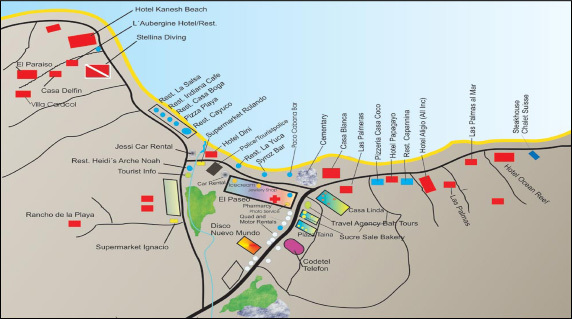 In the heart of Las Terrenas you can find the hotel San Ferreol. This hotel offers 7 bungalows fully equipped, with warm water, kitchen, fan, balcony and a small garden. The hotel is located 100 meters from the beach and the center of the city, the prices from the bungalows are starting from to 20$US per person until 39$US per bungalow for a maximum of 5 to 6 people. quiet an tranquil hotel, clean and serious, you will be received by Yves y Clotilde. The hotel is located 150 meters from a beautiful Beach with white sand protected by a coral reef, this beach is accessible by a sand road, the hotel offers you 8 bungalows from 2 until 4 people, a restaurant and a bar located in the beautiful tropical garden, the prices are from 45 until 55 euros per night and per person, according to the season from 100 until 120 euros per night for 4 persons. There are some bars which are open late like, Syrose or the Paco Cabaña. You can find them on the end of the mainroad in front of the Plaza el Paseo next to the beach, nice ambiance to spend a moment. You can also visit the discotheque "El Nuevo Mundo" which is located on the mainroad, a more typical ambiance with a mix of Merengue, Batchata and Reggeatón. You can find small buses or cars (public taxi) which go from Samana to Sanchez, their stops are anywhere along the main road. Also you can find motorcycle taxis (moto conchos) anywhere around the city and they'll take you anywhere you want to go, there are some taxis which you can find around the Plaza of el Paseo. In the airport El Portillo you have a daily flight to the airport of Las Americas (international airport of Santo Domingo). You can find more information's and flight tickets at the tour operater office in front of the Plaza el Paseo. The flight takes about 30 minutes and the landscape view is just magnificent, you can see the bay of samana, the national park los Haitises and the village of Las terrenas during the flight. In the plaza of el Paseo you'll find an ATM machine and many souvenir stores. supermarkets, Jewelery Stores, cigar shops and other shops you can find along the mainroad of las Terrenas so you can easily find what your looking for. On the mainroad of las Terrenas you'll also find a French bakery. But watch out most of the prices are higher in las terrenas then in the rest of the country. You can find an internet cafe in the city, also you can find 2 of them in the plaza of el Paseo, a calling center from Verizon in the center of the city and there is an Orange shop located on the mainroad l.